# Cute and Adorable Characters! From cute animal types to charming human types! More than 550 types of Astromon await you in Monster super League! # Catch your very own Astromon! 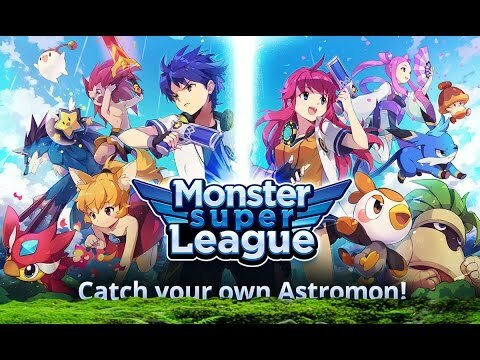 In Monster super League you catch your own Astromon! Catch and evolve Astromon of your liking! There is a large change in looks and strength as Astromon grow! Also, all Astromon can be evolved to ★6! Evolve your Astromon in your own unique way! Even the same Astromon can differ by attributes or combat style. and enjoy adventure and combat! Have a great time with your Astromon on your airship! Sometimes you might even have a suprise visitor! # Play live with friends! Chat with friends, and exchange presents! Engage in a heated discussion on Astromon! # Become stronger in different ways! Combat is not the only way to become stronger! Achieve faster growth with fruit, and additional power with gems! Various areas with 8 unique storylines! Battle against other Astromon in the Astromon League! Embark on countless adventures in Monster super League! Follow up on the latest news and events on the Monster super League official community!